Come and join the exciting world of Restoration. It’s exciting because we love dealing with people. We help our customers put their lives back together after storms, floods or fire events and it is something we are proud of. We are expert at what we do through some of the best training industry can offer and believe it can only make us even more adept in assisting our customers. As importantly, we care about our own people, celebrate their achievements and we are growing all the time. 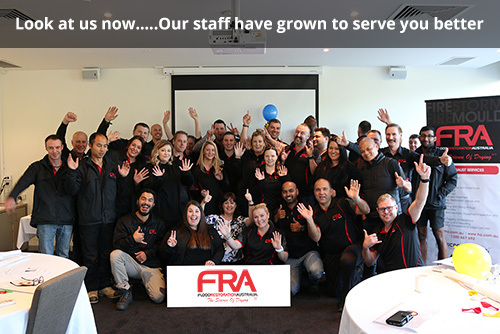 Can you see yourself being part of our team? Why not let us know. We work in a positive and successful environment that values the time you spend with us. No, we’re not the Addams or Manson family, but we do have a family culture where we work hard, celebrate our achievements together, have some fun and where we want the best outcome for everyone we deal with. 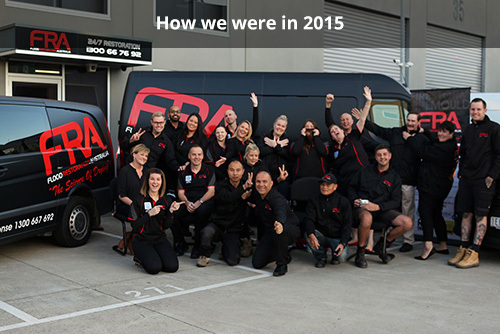 Our new Head Office is located in the growing area of Melbourne in the South Eastern suburbs. It’s less than 45 minutes from the CBD. Plenty of parking and near Eastlink, our staff find it’s an easy drive. We have a MD that just loves his coffee. Maybe it’s his Italian heritage, but the relaxed atmosphere will be boosted by sharing a coffee, tea or hot chocolate with the team. Flood Restoration Australia uses Seek for its career positions with us. Please check their website for our advertisements and type in the words with the quotation marks… “Flood Restoration Australia”.